Today's re-post consists of one of my all time favorite mixes. How can you go wrong? One of the best deejays mixing ones of the best groups, pure dopeness. Below is the original post. "I'll do my best Jeru and com clean, I didn't even know this mixtape existed until two days ago when I was surfing through the okayplayer site. Now answer me this, do I go straight to Hip Hop hell for not knowing about this promo mixtape? 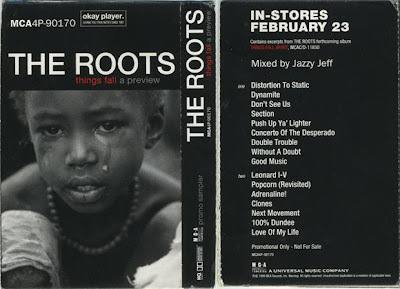 While I'm thinking back to the whole Things Fall Apart era, I remember seeing the Roots for the first time at a Smoking Grooves concert (I think?) at Universal Amphitheatre back in 1999. The concert lineup consisted of Macy Gray, Everlast, The Roots, Eminem, and The Black Eyed Peas (performing in that order). Keep in mind that this was at a time where BEP's biggest hit was "Joints and Jams." I'll never forget Eminmen coming on stage and the whole crowd going nuts and as soon as the shady one's set was over, the whole crowd instantaneously evacuates the premises as if someone had just finished yelling "bomb!" I didn't stick around because I had no interest in seeing BEP, but I bet they didn't perform in front of more than 13 or 14 people (stage crew included). In any event, enough of my blah, blah, blah.... Enjoy the mix."